After spending their winters apart in different places – sometimes thousands of miles from where they breed, hawks, falcons and eagles are returning to the areas where they mate and nest. Not all hawks migrate, but the ones that do return to the same spot, and sometimes the exact same nest, often to meet u p with the same mate they had the year before. Males return first to establish their territory and the females return shortly after the males. Hawks seem to be monogamous for at the very least during the breeding season, but many birds of prey keep the same mates throughout their lives. This is true of two very different species –Red-tailed hawks and Peregrine falcons. Red-tailed hawks are ready to breed when they are about 3 years old. 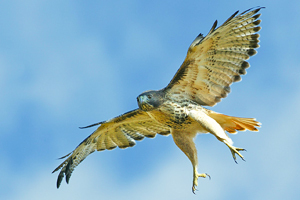 In the late winter, you can hear and see male Red-tails calling overhead and doing all kinds of cool aerial soaring and dives to attract a female. The females will fly with Mr. Right in high circles and they do a sort of dance in the sky together. When the male dives towards her, sometimes they will fall through the sky clutching talons. It’s quite a show! Often this is the same pair bonding again after being separated for the winter. If one or the other doesn’t show up during this period, the remaining bird will find another mate and start the same relationship with this new partner. Both of them build the nest. If it’s a nest that has been used before, then it often needs repairs and updating, and like an eagle’s nest, just gets bigger every year. They also share the housekeeping and the incubation responsibilities. You can look for Red-tailed hawk nests in cities on buildings and in the country in a tree 15-20 feet off the ground or sometimes on a cliff, and they are amazing to watch during the mating as well as nesting season as there is a lot of team work to get their brood raised. With a name like “wanderer” it should come as no surprise that Peregrine falcon pairs often migrate separately many thousands of miles away – their roundtrip migration might be over 15,000 miles! But they return each year to the same nest and the same mate. Unlike their bigger cousin the Red-tail hawk, Peregrines don’t build big nests. They make a little “scrape” on a ledge on a cliff and lay their eggs there. Peregrines were nearly extinct in the wild a few decades ago, but they found new lease on life in man-made nest boxes in cities. So, look for them cruising above the open water in cities and nesting in church towers and on bridges. At this time of year watch and listen for their exciting aerial displays and loud mating calls. When they fly together, sometimes they will touch bills in the air and exchange food with one bird upside down. Pretty amazing! When you know what to look and listen for, its easy to make the right ID, and every bird in our app has helpful ways to learn to identify birds. Let our Wild About Birds! 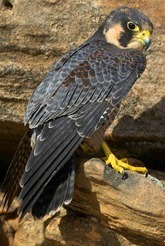 iPhone/iPad app help you and your family have fun learning about birds of prey.